Justice Secretary Leila de Lima announced that refugees “cannot always be expected to obtain travel documents particularly where the agent of persecution is the state.” The United Nations High Commission on Refugees saluted the country’s "strong humanitarian tradition.” Post after repost streamed down timelines, prefaced with messages shared by aid workers and international protection officers and the occasional old friend from Australia. This is how it’s done, they said. Look at the Philippines. Look at what they’ve done. I suspect I am one of many who were initially confused, not so much by the reports, but by the general air of surprise and congratulatory glee that greeted the government announcement. An earlier report that the country would push back the boat people – a misinterpretation later corrected by the government – was received with doubt by news editors and roundly protested on social media. Many of us assumed we would welcome the Rohingya. It was just a question of when. There are some truths I know. The drowning season will begin in June. The bribes will appear before the campaigns roll. The malls will fill in the sweaty noon, the clowns will dance with the corrupt, and the ports will open for refugees, wherever they are from. They are the Muslims of Northern Rakhine state, more than a million strong, born in Myanmar with family going back generations. They call themselves the Rohingya. Myanmar denies them even their name. They have, instead, been called Bengalis, identified by Myanmar as natives of a Bangladesh that disclaims them, marked as foreigners and illegal immigrants, subject to abuse and deportation. The Rohingya have been called the most persecuted in the world, a Muslim minority whose mosques were burned by nationalists seeking "to protect Buddhism.” Most have been denied citizenship and evicted from their homes. Although they have been discriminated for decades, ethnic violence came to a head in 2012 when thousands of Arakan men, “armed with machetes, swords, homemade guns, Molotov cocktails, and other weapons descended upon and attacked Muslim villages,” torching homes and killing residents. An estimated 140,000 fled into refugee camps, where conditions are difficult and food is scarce. Although they have not been permitted to leave, The Economist reported that in the first three months of 2015, 25,000 Rohingya, including those living on the borders of Bangladesh, bought their way into boats in an attempt to reach friendlier shores. At least 300 have died. Some of those boats drifted into the waters of Indonesia, Malaysia and Thailand – and forced the crisis that is now testing the convictions of the international community. The Thai navy repaired their engine, gave them provisions, and pronounced them ready to travel. For the Rohingya, the dream has become anywhere but home. In 2014, according to the UNHCR, 9 Rohingya migrants were allowed into the Philippines "to be free from fear that they're going to be sold again." "They were allowed to come into the Philippines while their processing took place, and regained a few kilos, regained their health, regained some dignity, and proceeded onwards to reach their resettlement countries," said Bernard Kerblat, country representative of the UNHCR. "What was needed at that time,” said Kerblat, “is to find a sovereign state ready to accept them even for a short time." This is the Republic of the Philippines, pearl of the orient, cradle of the brave, ringed by fire and drowned by storm, where the disaster season begins in July, lasts until Christmas, then staggers into a rehabilitation period that ends when the next typhoon decimates another province. Welcome to the last country outside the Vatican without divorce, the third most dangerous country for journalists, whose airport was celebrated for rising to fourth worst instead of first, whose road traffic maintains its place as the ninth worst in the world. This is where a doctor can be jailed for removing a fetus to save a mother's life, where most live under the poverty line, and where it is possible, if you know where to go, to buy unmarked abortifacients in the back alleys leading to the Church of the Black Nazarene. And yet, according to the UN, it is also the country that in 2012 became “the first country in the Asia-Pacific region to establish a procedure to protect both refugees and stateless people." Of the many and varied ways we define ourselves, we are also a people who will open our ports to the very desperate. It is not the first time. On September 8, 1937, a steamship named Gneisenau carrying German Jews escaping the Holocaust arrived in Manila, and was given official welcome by the Quezon government. World War II did not just bring in more Jews, but also Chinese refugees and residents of the British colony of Hong Kong. The Philippines remained open to refugees until December 8, 1941 – the day the Japanese arrived with their bayonets and burned cities to the ground. "We would not be alive today if not for the Philippines,” said 84-year-old Lotte Hershfield. “We would've been destroyed in the crematorium." In 1949, the International Refugee Organization made an appeal to the international community for safe refuge on behalf of thousands of White Russians whose lives were endangered by civil war after the Bolshevik Revolution. Only one country offered protection – the Philippines, whose government granted temporary shelter to an estimated 6,000 Russians in the former naval base of Tubabao Island in Guiuan, Eastern Samar. In 1975, the mounting massacres by the Khmer Rouge in Cambodia as well as threats from Vietnam’s new communist government sent thousands of refugees into exile. Many were provided with food, shelter and education by the Philippine Refugee Processing Center. In the 20 years the center was in service, over 400,000 Indochina refugees passed through its doors. I write this in an attempt to understand, if only for myself, what seems to be a national impulse in a country that can barely support its own. It is a compulsion we have rarely questioned, but is now thrown into sharp relief by the crisis in the Andaman Sea. There is no easy explanation. It may be little more than the practicality of living in an archipelago with porous borders. Or it could be another inheritance from the American occupation, much the same as free speech, secular governance and a great and abiding love for imported spam. And yet it’s difficult to believe all this is nothing more than a result of habit and circumstance. It is the same impulse that has a barber who lost his shop in a typhoon offering jobs to the two barbers who lost their homes. It is an impulse that lives in the aftermath of disaster – the widow and her children surviving on looted goods dropped off by tattooed men, the father wrapping the corpse of his neighbor’s daughter just after he lost his wife, the displaced mother insisting on feeding journalists out of her meager store. In 2012, after Typhoon Pablo ripped through Compostela Valley, I was sent to New Bataan to cover the survivors. It was 5 days after the storm, and the evacuation center smelled of sweat and corpses. I remember a woman in her late fifties, a grandmother who had travelled 8 hours by jeep with her miner husband. They had come for their daughter, and were told she was dead. Their two grandchildren had survived. They were all going home, she said, to the house near the mines where the children would be raised as their own. Her husband walked in, trailing a 9-year-old boy. The boy was an orphan, said the miner, and had been snatched by a neighbor from the flashfloods in time to see his parents and older brother drown. If no one claimed the boy, said the old man, they would bring him home. Today, Malaysia, Indonesia and Thailand have committed to the rescue of what may be thousands of refugees still at sea. Indonesia and Malaysia have already offered temporary refuge. A number of countries, including the United States, have promised resettlement assistance. I’d like to believe the Philippines had some influence in the sudden reversal of positions, but I'm also well aware it could have just as well been a function of timing and circumstance. Aceh’s fishermen were rescuing boat people even before Indonesia officially allowed the Rohingya to disembark. Thailand and Malaysia, before their crackdown on refugees, have themselves given shelter to tens of thousands of Rohingya refugees. The truth is that we’re not all that different. It is only that we took a stand, at a time when everyone else had decided they had done enough. I suspect it is at these moments when we are at our best, when we realize there is no one left to stand but us. 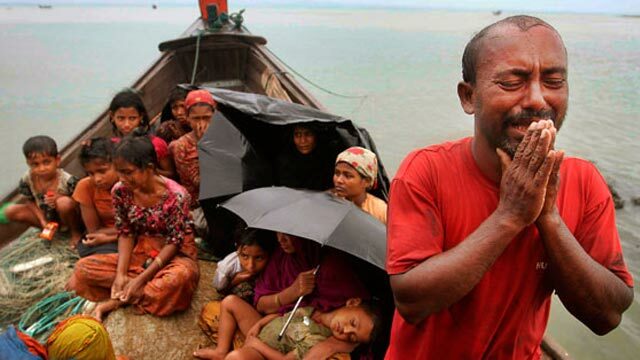 I don’t believe there's any irony in a Catholic country welcoming Rohingya migrants, in much the same way as there was no surprise when Jews and Protestants sailed into our ports. Our Muslim south is just as vehement in their demand we offer aid, promising land and protection to the Rohingya. This is not about religion, as much as it is about memory and necessity and pride. We know what it is to live as underdogs. We have fought losing wars, have marched unarmed and singing towards a tyrant’s loaded cannons, and still stood cheering as our pound-for-pound national hero lost what may be recorded as the most monotonous boxing match in sports history. Many of us recognize the reckless courage it took for the Rohingya to smuggle their children into tilting boats. It is the same sacrifice we’ve seen in millions of our own, who have risked abuse overseas for the sake of future and family. We know what it is to beg. We've stood at the receiving end of charity and contempt. Maybe this is why so many of us will look past political cost and practical consideration to the reality of bone and muscle and beating heart. I don't have the answers. All I know is that if the cost of generosity is high, the price of our refusal will be much higher still. The crisis is not over, but the Rohingya are now welcome in the countries they sought. Thousands have been rescued and are now under the care of Malaysia and Indonesia. The Philippines, many miles distant, will have little need to prepare its coasts. The Rohingya's imagined future has never been this country – a nation big on dreams and short on reality, torn by conflict, wracked by disaster, whose own people look to the distance for greener pastures. We know what we are. We are the port of last resort, and have little to offer beyond a separate peace. Yet I write this with pride, in the hope that there will always be a cluster of islands southwest of the Pacific, where no ship in need is called unwanted. There are many days – when the thousands stand sweating at midmorning waiting for trains that do not come, when another toddler dies of piss-poor conditions in Zamboanga, when a chinless senator howls about the Muslim scourge, when another scandal and another charge and another whistle-blower takes over the headlines – when there is cause to be ashamed of who we are. Patricia Evangelista is a field reporter and the multimedia manager of Rappler.com. She covers disaster, conflict, human rights and development issues. Follow her at @patevangelista.